Strolling through the streets of the city as he flits about from house to house and job to job, Figaro, the title character of The Barber of Seville, enjoys a freewheeling lifestyle limited only by his own imagination. The circumstances of Rosina, the opera’s principal female character, could hardly be more different. Her movements are restricted to the house of Doctor Bartolo, her guardian, and she fears that she may be trapped there forever, as Bartolo intends to marry her. But when Figaro learns that his friend Count Almaviva is smitten with Rosina, he devises a plan to bring them together, and at first it seems to work brilliantly. The nobleman disguises himself as a poor student named Lindoro to ensure that Rosina loves him for who he truly is, not for his title. She reciprocates his feelings and proclaims that “Lindoro shall be mine.” What could go wrong? Plenty, it turns out, and the ensuing hijinks—disguises, distractions, furtive professions of love, a major misunderstanding—unfold one after another, keeping the lovers’ fate uncertain until the opera’s final moments. Yet that uncertainty never feels overly worrisome, thanks to Barber’s plentiful humor and lighthearted plot. Rossini’s effervescent musical style, in which exuberantly virtuosic melodies glide above an elegant, agile orchestra, welcomes listeners into a world of wit, energy, and sparkle. Together, these musical and dramatic qualities contribute to Barber’s standing as an exemplar of opera buffa and as one of the most popular operas ever written. The piece is a perpetual favorite not only in opera houses around the world but also in popular culture, invoked and parodied in cartoons, sitcoms, and films. In short, even if you haven’t previously attended a performance of Barber, you’ve surely heard bits and pieces of it before. A sense of familiarity would have informed the audience’s experience at the opera’s 1816 premiere as well. Barber is based on the first play of a trilogy by the eighteenth-century French playwright Pierre Beaumarchais, a work that had previously been adapted by several other composers, most notably Giovanni Paisiello. Rossini also indulged his proclivity for recycling tunes, borrowing freely from his own past work. For instance, the music of “Una voce poco fa,” Rosina’s celebrated opening aria, had appeared in Rossini’s opera Elisabetta, about the Queen of England, just one year earlier. rejecting, or at least skirting the issue of, the social and political ideals expressed in Mozart’s work; it has become a commonplace to think of Barber as Figaro’s lighter, less lofty relative. But that comparison is somewhat misleading: Rossini’s goals were quite different from Mozart’s, and what makes Barber so beloved is not so much what the opera does as how the piece works. Put another way, Rossini doesn’t reinvent the conventions of Italian comic opera—its musical structures, characters, and plot devices—but he uses them more brilliantly than just about anybody else. Craft, virtuosity, and performance are the opera’s currency. These same qualities are vital to understanding both Figaro and Rosina. Despite their very different lives, both are impressively adaptable, and they excel at performing whatever role the circumstances might require. As the self-described “factotum” of Seville, Figaro is “ready for anything / by night or by day,” he boasts. The clever valet-turned-barber-turned-anything-you-need- him-to-be lives as virtuosically as he sings. Movement and flexibility are vital to his success: “Figaro here, Figaro there, Figaro up, Figaro down,” he sings with delight. Yet what Rosina lacks in physical mobility, she makes up for in emotional virtuosity. Her resourcefulness is abundant: whether she’s surreptitiously floating a letter down from the balcony or whispering to her lover while Bartolo dozes, she knows how to react instantaneously and cleverly, making the most of what she has. By necessity, she becomes a sort of emotional factotum, thinking on her feet and doing whatever the situation requires in order to achieve her goals. This is not to say that Rosina manages to break free from the confines of her particular situation, or from gendered social roles more broadly. In the final scenes of the opera, she reacts all too credulously when first Bartolo convinces her that “Lindoro” has deceived her, then rejoices uncritically when she finds out that Lindoro and the Count are one and the same. In the blink of an eye, she gets married and delights in her good fortune, the shenanigans of the past 24 hours seemingly forgotten. This sudden shift casts Rosina’s earlier actions in a different light; perhaps her emotional savviness was not so much a sign of inherent rebelliousness as it was a means to a highly conventional end. Or perhaps the shift in her character has to do with Rossini’s adherence to the conventions of comic opera, namely the need to conclude Barber with a happy marriage regardless of what had previously transpired. Rebellious or not, Rosina remains a versatile and virtuosic character, rich with interpretive possibility. Like any great artist, who uses the limited space of the stage to construct an entire universe, she uses her wits and mental dexterity to maximum effect. 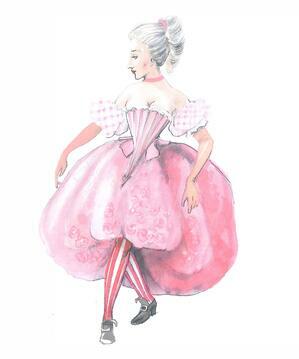 In a world overflowing with performances both musical (the serenades outside her window, the music lesson in Act II) and social (the Count’s many disguises, Figaro’s outlandish schemes), she is the ultimate performer. And she knows it. As she famously states in “Una voce poco fa,” she contains multitudes: she may seem sweet and docile at first, but try her and she’ll transform into a viper, ready to fight. What’s impressive about her declaration is not only the fact of her expressive range, but also her confident self-knowledge. That quality is something that Rosina’s circumstances, no matter how restrictive, can never alter. Part of her will always be limitless. Images (top to bottom): Costume design for Rosina from the new BLO production, by designer Gianluca Falaschi; Engraving of the Italian contralto Geltrude Righetti-Giorgi, who originated the role, circa 1820, Victoria and Albert Museum, Harry R. Beard Collection, given by Isobel Beard. 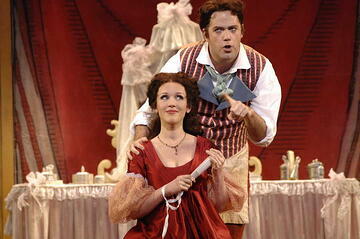 Sarah Coburn as Rosina and Jonathan Beyer as Figaro in BLO’s 2012 The Barber of Seville, photography by Eric Antoniou.